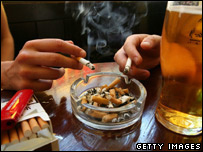 A Blackpool landlord could become the first in England to be prosecuted under the new anti-smoking legislation. Hamish Howitt faces a fine of up to £2,500 for defying the new laws and allowing his customers to light up inside his Happy Scots Bar. Officers from Blackpool Council handed out three £50 fixed penalty notices to smokers over the weekend. The council now plans to interview Mr Howitt and compile evidence to hand to its legal team for a summons. Mr Howitt has been a vocal critic of the smoking ban and has been openly defying the legislation since it came into force on 1 July. When officers visited the pub on Friday and Saturday they found some customers smoking using ashtrays provided by the landlord. Blackpool Council said it had been approaching the enforcement of the legislation in the resort in a non-confrontational way but had exhausted all avenues with Mr Howitt. "So far, we have had a very high level of compliance across the town and businesses are responding positively," a spokeswoman said. "With regards to Mr Howitt, he has been verbally informed that he has been reported for prosecution twice and investigations are ongoing. "We are hoping to summon him to court to continue with legal proceedings against him." Owners and managers of pubs and clubs which fail to comply with the smoking laws can face fines of up to £2,500 - and individual smokers can be fined £50. Blackpool Council said any prosecution of one of the resort's bars or pubs could lead to a loss of licence. All enclosed public places are now smoke-free zones, a change which the government says is backed by about 80% of the population.